Well, I'm busy as heck, but I did take a little time to do a quick halloween pic of my TLS characters dressed up as anime characters! See if anyone can actually name them all! 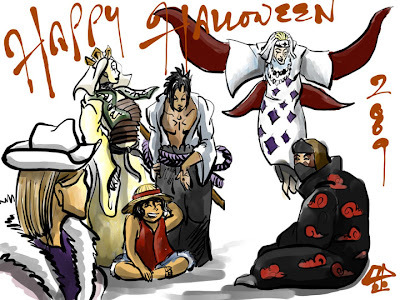 Enjoy your Halloween, don't eat too much candy ;) And happy comicking! Grill, whenever you have time or room in your queue. One thing I should mention straightaway is Sunset Grill is a 3D art comic. That is, a comic made out of screenshots from custom made 3D models. There are quite a few of them out there, but I never really caught on to them for some reason. Looks like this is a good chance to study why. I finally got around to reading Sunset Grill. It took me a couple of days to get through the archive, and another few days to actually think about what I wanted to say in words. Firstly I have to say I really like your writing, there's a wry sense of humour and the dialogue is funny. The futuristic setting and class conflicts, underworld and characters are also well-developed and engaging. I have a problem with your speech bubbles though... more on that later. The uncanny valley hypothesis holds that when robots and other facsimiles of humans look and act almost like actual humans, it causes a response of revulsion among human observers. I think this is the biggest obstacle you are going to have to overcome. People are weird with regards to this thing. The more realistic the art looks, the less they tend to like it. Especially if it's 3D. I experienced a little bit of this when I started reading your comic, it took a couple of chapters before I could stop feeling uncomfortable about it. I believe Pixar avoided this syndrome by heavily stylizing their 3D characters in The Incredibles and Up! You might want to consider it. I'm not saying that you should immediately drop your art style and copy theirs, or anyone's. But I just wanted to bring your attention to this point, so you can decide for yourself what you would like to do about it. Basically, if a 3D depiction of a human being is "almost real", but not quite, or does not quite act like what it is expected to be, psychologically it can creep out the viewer. My opinion is this is because what they see is something almost "real" but part of their mind tells them something is not quite right with it... so DANGER! THINGS ARE NOT WHAT THEY SEEM! Which explains the discomfort. Bottomline is, having your stuff in between these two extremes is kind of a danger zone. You might get the Uncanny Valley effect... you might not, and it varies from person to person. The 3D models are given a lot of attention to detail. I like how you vary their features so much, the fine details you put in their clothes. But when you put them in comic form... the panels and pages well... feel... dead. Very static. Realistic-looking, and posing is good, but there's a problem with comics about being just realistic and nothing else. Correct me if I am wrong, but in my book 3D art is mainly works for animation. I think it works pretty well to convey an action realistically if you have the advantage of moving frames. Unfortunately this is a comic. In a comic you need to compress several frames of action into a single panel. And for that to work well... you need to exaggerate the hell out of your art and posturing as compensation. Sometimes people describe it as the art having a lot of "energy". Sometimes this means throwing the rules of time and laws of physics out the window... or at least bending them a bit. For example there is a scene I quite liked where the cook Ana confronts Corrine for selling her out... with a kitchen cleaver. This is in terms of posturing only. There is another problem in the colour palette used in the comic... It's always the same range of colours, and they do not change to reflect the environment. At most it gets slightly lighter and darker, but that's it. Here's an example. The setting for this is supposed to be a creepy street or backalley. I wouldn't really expect to see it lighted so well with soft, warm lights that show the colour of things so clearly! A few seconds' work of levels adjustments throw deep shadows and take out some of the warmness, giving the feeling of harsh, fluorescent, street lighting in a god-forsaken part of town. 3. Very limited fixed perspectives and panel composition/speech balloons. I have a love/hate affair with speech bubbles. Mostly its because many people use speech bubbles that clash with their art style. 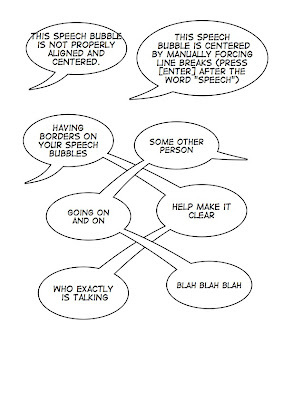 Speech bubbles like those used in comic life mimic those used in American comic books. The art style is bright bold and cartoony most of the time. It works well. The cartoonyness of the font and bubbles do not as work well with realistic 3D art. Lastly, the layout of the bubbles can be confusing. Sometimes they overlap and it's hard to see who is saying what. The other thing is that the composition of the panels is severely limited. I don't think I would be exaggerating if offhand... I said that 90% of the pages in Sunset Grill just consist of two characters standing and talking. The camera tends to stay fixed at the same distance from the talking characters, and takes pictures of them from the same angle. This can be fine for a humour comic, but it can be boring as well. For a comic with action it's a complete No-NO. After a while all the panels start looking the same. And that is pretty much synonymous with "boring", which in turn is synonymous with "bad". 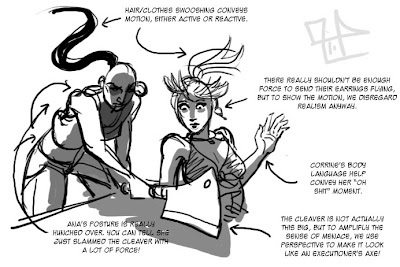 Consider changing the point of view, add more close ups or compose the panel from the POV of the characters, and maybe even focus on inanimate objects when the long dialogues are going on. Let the camera explore a little more. You can discover interesting ways to tell a story when you don't just take the direct approach of putting text and the picture of the character who said it together in the same panel. Overall, I think your writing's good, but your medium of presentation and execution needs more work to stand out. I'm still not convinced about using 3D art for comics yet, but I do respect your choice to use them and I hope the points here will help you improve them. Good luck, and happy comicking! Edit: ArtPatient also reviewed this Sunset Grill a few months ago here.